I also drizzled them in dark chocolate because toasted marshmallow + chocolate = s’mores. Let’s be honest, graham crackers just prevent your fingers from getting burnt, but the heart of a s’more is melted chocolate and a perfectly blistered gooey marshmallow. These are really fun to make, just like burning marshmallows on a stick, which I always do, ON PURPOSE. You just have to watch the broiler like a hawk. I put the rice krispie treats into a cold toaster oven (because preheating an oven on Broil strikes fear in me), turned on the Broil setting, and popped them out of the oven at exactly 2 minutes and 37 seconds. If you’re using a toaster oven, you can set a timer for 2:37, but if you are using a regular oven, then be a hawk. Drizzle them in melted chocolate if you, too, have s’mores on your mind. 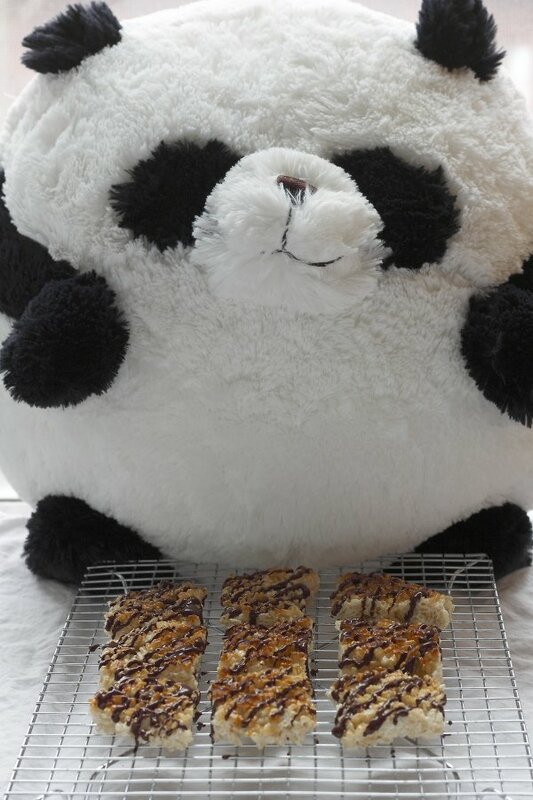 Lastly, invite your friends over while you are taking blog photos and humor them while they put Baozi, a giant panda bear, in front of these jacked up rice krispie treats for… scale? Baozi got some melted chocolate on his belly so I had to give him a bath and a blow-dry after, but he looks happy, doesn’t he? I took the original recipe for Rice Krispie Treats, broiled them for 2 minutes and 37 seconds in a toaster oven (no preheating), and drizzled them in dark chocolate. Broil times may vary, so watch your oven like a hawk. In a large nonstick pot or pan, melt butter over low heat. Add marshmallows and stir until melted. Remove from heat and add the cereal. Stir until well mixed. Line a 13 x 9 inch pan with wax paper and evenly press the cereal mixture into the pan. Let cool completely, then slice into squares. 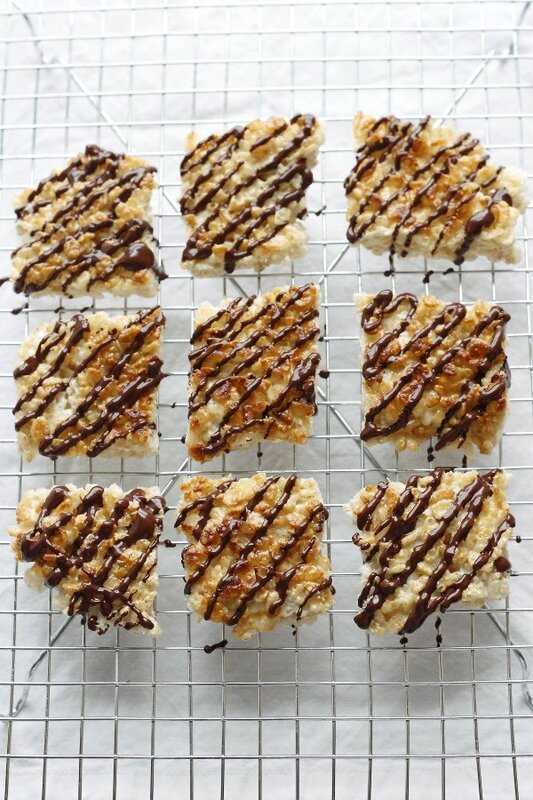 Place the rice krispie treats on a baking sheet lined with parchment paper. Place the baking sheet a few inches below the broiler in a cold oven. Broil for approximately 2 minutes or until the tops are golden brown. It's best to watch through the oven door or check on your treats every 30 seconds. Take the treats out of the oven and slide the entire sheet of parchment paper onto a cooling rack. Melt chocolate in a heat-proof bowl over a small pot of barely simmering water. 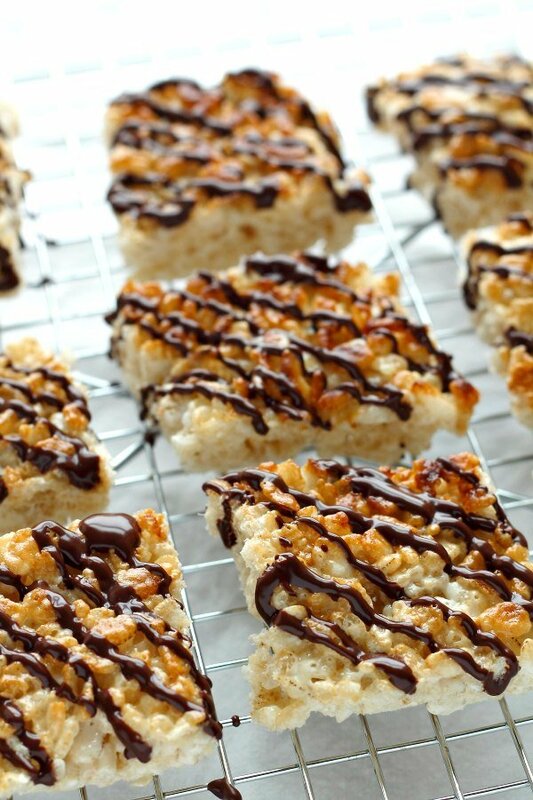 Using a spoon, drizzle the melted chocolate over the rice krispie treats. Best if eaten within a day. Love your Baozi. He looks very happy! 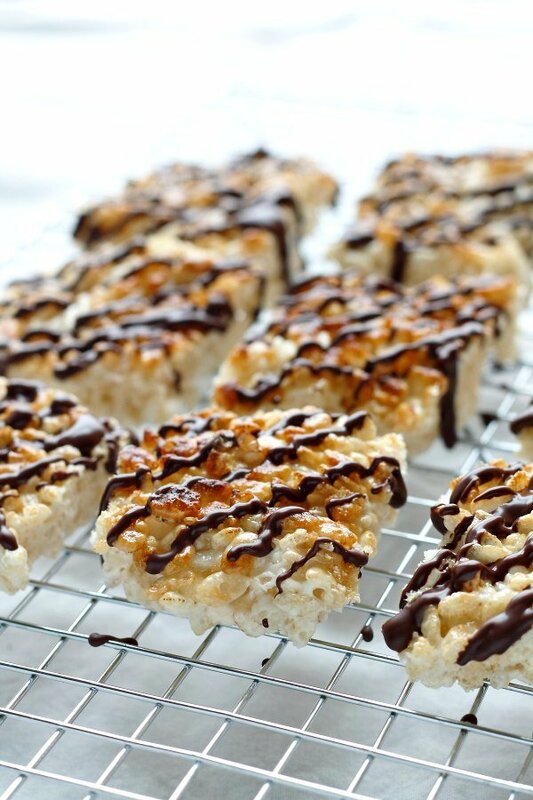 What a neat way to spruce up classic Rice Krispies treats! And an adult slumber party (*especially* one with eight pounds of guacamole) sounds super fun – I totally want to have one of those! These are so pretty! Almost to pretty to eat. Almost! 🙂 Pinned!